This post is a follow-up to the previous discussion of Nancy Hewitt’s AHA paper. If you are interested in reading more about how universities have changed in the past thirty years as women, queer scholars, and scholars of color have integrated (or infiltrated?) 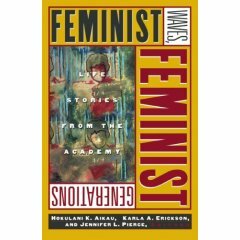 the faculty, see Feminist Waves, Feminist Generations: Life Stories From the Academy (University of Minnesota Press, 2007), edited by Hokulani K. Aikau, Karla A. Erickson, and Jennifer L. Pierce. The contributors for the most part are or were UM faculty or graduate students, and span three generations of scholars. See in particular Janet D. Spector’s essay on feminist archaeology, Toni McNaron’s description of gay and lesbian faculty life from the 1960s to the 1990s, Jennifer L. Pierce’s story of her abuse by one UM department, and her (successful) efforts to fight back, and Roderick A. Ferguson’s “Sissies at the Picnic: The Subjugated Knowledges of a Black Rural Queer.” (Sorry–I couldn’t shorten, let alone improve on that title!) Finally, returning to the this blog’s preoccupation with the exploitation of women’s labor, don’t miss “Innovation is Overtime: An Ethical Analysis of ‘Politically Committed’ Labor” by Lisa J. Disch and Jean M. O’Brien. It explains how Corporate University (TM), despite giving politically committed faculty only resistance and no resources, nevertheless benefits from the uncompensated and unrewarded labor of many faculty members because of their commitments to change. Those Women’s Studies programs and Ethnic Studies departments weren’t there fifty years ago, and you didn’t think they invented themselves out of thin air like the Invisible Village of Peace, Freedom, and Love, did you? ← Nancy Hewitt dishes on "The Leaky Pipeline"
Ah, yes, the exploitation of commitment. I go back and forth. There are times when I say, my job is to serve my students, whether or not I have institutional support to do so. But there are times when I feel as if I should just punch the clock….